More and more Huawei LTE advanced mobile routers are available in the market now. Many customers are not satisfied with the basic LTE and want to get higher LTE speeds. So they must get LTE advanced or LTE-A pro router to fulfill that. Huawei E5788 and E5885 are the two hot new models in the Huawei E5 MiFi family. 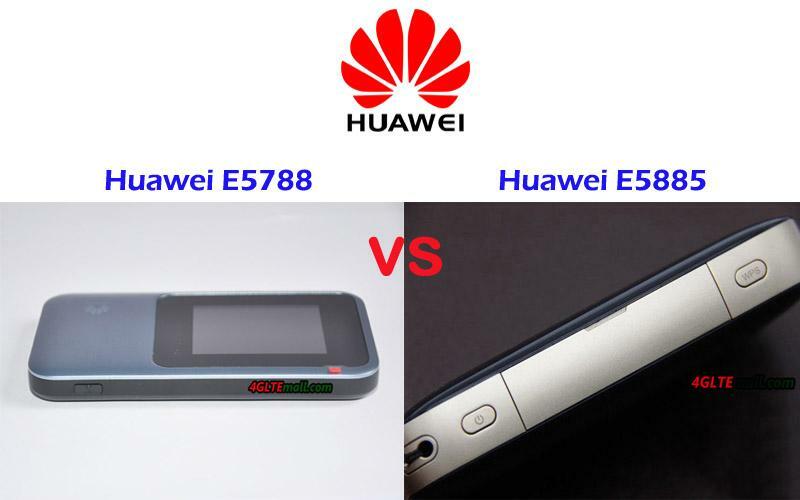 For those who want to buy one from the two mobile hotspots, they may ask: What’s the difference between the Huawei E5885 and E5788? And which one is better? We will review the appearance, interfaces, specs, and other features to find the answers. Huawei E5788 is the latest Huawei LTE advanced pro mobile 4G router with a touch screen. Comparing with its predecessors, Huawei E5788 is thinner and has better hand feel. The power button is on the top edge side while the USB 3.0 port and SIM card slot are on the opposite side. We can’t find the connector for an external antenna, which is the standard configuration in other Huawei E5 mobile hotspots such as E5787 and E5786. The backcover of Huawei E5788 can’t be removed and the battery is built-in and non-removable. The Huawei Mobile WiFi Pro 2 E5885 is also the latest new LTE-A mobile router. The typical feature is that it has one Ethernet port and USB input and output interfaces. There is only one small screen on the front to show the connection status. The power button and WPS are located at the two sides of the interfaces. Similarly, the Huawei E5885 also has no connector for external antenna. The Huawei E5885 is thicker than the normal Huawei E5 pocket WiFi hotspots. The battery of Huawei E5885 is also non-removable; however, the backcover can be removed. Huawei E5885 and E5788 both use Micro SIM size. The Huawei E5885 has the slot for Micro SD storage but E5788 has not. From the specs, the Huawei E5788 is more advanced with the support of LTE advanced Pro technologies, such as 4 x 4 MIMO and 4CC CA. And Huawei E5788 supports more LTE frequency bands, which make it could be used more widely. The highlight of Huawei E5788 LTE router should be the data transmission speed, it can reach peak download speed up to 1Gigabit/s, which is three times faster than that of Huawei E5885. The advanced features make the Huawei E5788 hotspot price expensive. As a new LTE-A mobile hotspot, Huawei E5885 could achieve download speed to 300mbps. They both support maximum users up to 32 devices. In most case, the Huawei E5885 is good enough for our daily lives. The highlight of Huawei E5885 is the Ethernet port, which is for WAN & LAN and provides more options for internet connection. What’s more, the large battery of Huawei E5885Ls-93a can make it work like a power bank to charge other devices. So the Huawei E5885 has more powerful functions than E5788. And the Huawei E5885 is in a cheaper price than E5788. If you just need a mobile hotspot supporting much faster speed, there is no doubt the Huawei E5788 is the right one. If you want to get a practical and powerful pocket WiFi, then Huawei E5885 would be the right one.